Looking for information about home values across the Treasure Valley? We have compiled the data in this easy to navigate page. We are here to answer your questions as you move through the process. Values over the last 13 Years? How Have Local Home Values Changed Over the Last 13 Years? The following charts track average sold prices of new and existing homes sold since the year 2005. You can see that home values peaked between 2006 and 2007 and reached the bottom of the real estate market during 2011. It has been a sellers market for years due to the interest from out of state buyers, lack of inventory of houses for sale and people's ability to pay. The ability to actually buy a home is important because there is a lot of interest from California, Portland and Seattle which have not only higher priced houses but also stronger incomes so their buying power is stronger. Many out of state buyers find Boise very affordable. Local residents' income have not kept up with appreciation and affordability has slowly become a challenge. The number of homes for sale remains at record low levels. 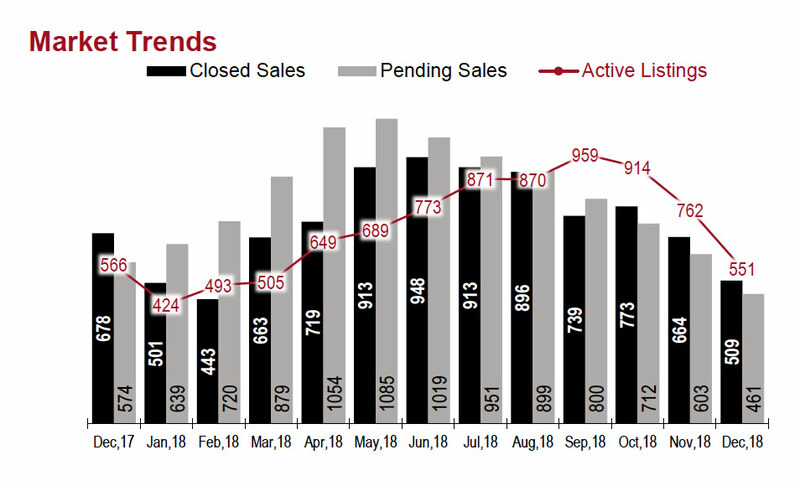 in December 2018, there was just over 1 month of inventory of houses for sale. This is that if no more homes became available to sell, there would only be enough homes to sell for a month based on current sales volume. A normal market should have 6 months of inventory. 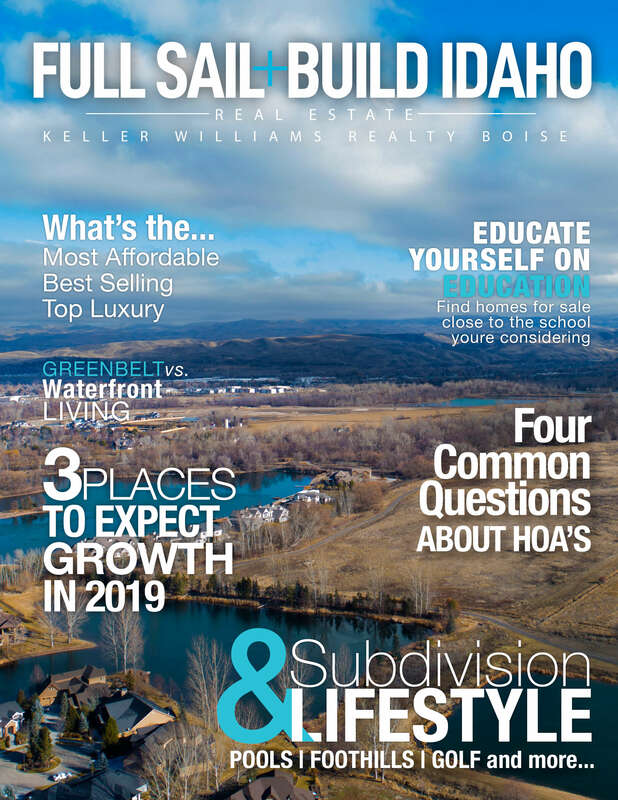 During the last quarter Idaho Real Estate Agents have been noticing subtle signs that the local real estate market is making small adjustments. Sales have been flattening out which could result in longer Days on Market. We are already noticing offers are looking different with fewer buyers in the market place. Boise remains a seller's market though! Why are home prices increasing? Boise, Idaho sees a lot of In-Migration with continued interest from California, Portland, Seattle and Salt Lake City. 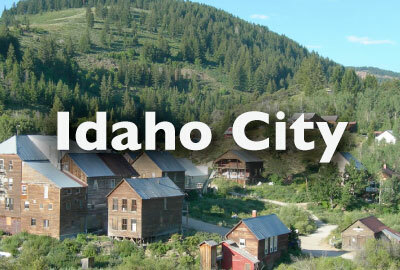 Most cite affordability, safety and friendly people of the area that live here is what attracts them to Idaho. The National economy is strong and Boise is also doing well. Demand for homes is driving sales but price increases are also driven by people's ability to buy and willingness to pay top dollar for properties. Lastly, many people are un-willing to sell. Some cite they cannot find something to move to and others have determined that they cannot find what they want based on appreciation of house values. Note: Buyers who purchased in 2010 have seen on average $165,000 of appreciation. Is Boise in a real estate bubble? 2018 was a busy year but trying to analyze a bubble bursting is different from that of 2005. First, recent market trend lines show that inventory remains low. Prices are increasing and housing inventory remains at some of the lowest levels Boise has historically seen based on population. In 2005, the market saw synchronised upward trends of homes for sale and price increases before the bubble burst. Also, mortgage guidelines are much more stringent, forcing buyers to be more realistic about their purchase. Treasure Valley continues to see a lot of in-migration from California, Partland and Seattle . How lond does it take to see homes increase in value by $165,145? 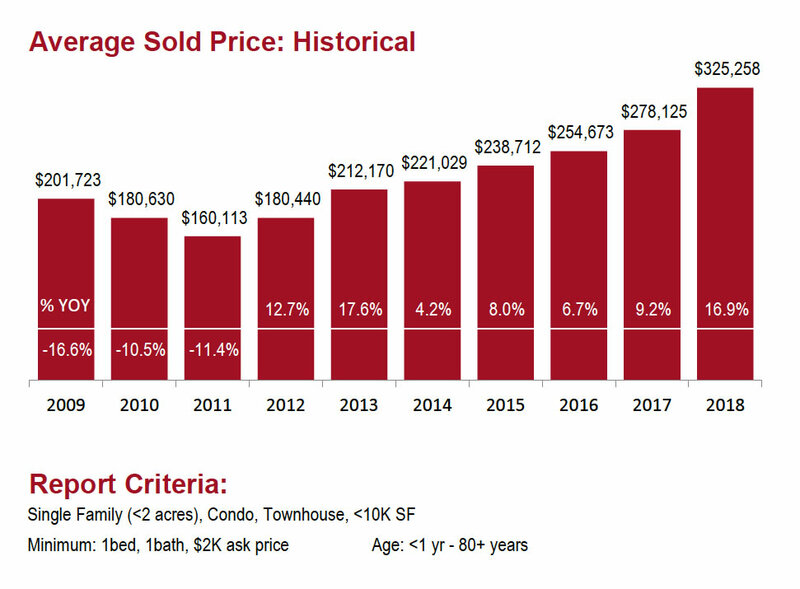 This chart display the average sold price of EXISTING homes by year. As you can see, for those that were either able to or lucky enough to buy in 2011, the bottom of the market, their homes may have appreciated $165,145 based on the median home values over the last 7 years. This is a great illustration that if you are buying real estate as an investment or looking to create wealth through real estate, it takes time. Note: There are also similar chart for each MLS Area to compare how each area performed. What does the History of Building Permits look like in Boise? Review the following chart of Building Permits pulled over the last 12 years. You can see how the market was out of control compared to today. Note: Building Permits do not represent actual homes built. The inventory of homes for sale is consistently short of what one would expect a normal real estate market; making it a seller's market. While there is a constant stream of new properties for sale all the time, buyers are frustrated with the lack of options to choose from. When you find the right home, be prepared to pull the trigger! Or be prepared for it to become someone else's home. Many homes sell for full price, so tactful negotiating is key to winning your home. Providing the seller a strong reason to consider your offer from price to proof of being able to purchase provides the seller confidence in your offer. Many buyers are looking at new construction as a way to find what they want without competing against other home buyers. A client of Full Sail + Build Idaho made an offer on a house priced at nearly $1M on the 14th day it was on the market and the seller was expecting four offers. An affordable home hit the market and by the end of the first weekend there were 12 offers. Pricing a home right the first time is a proven strategy to get the most money. When it is over priced, saavy buyers recognize it. As the house accumulates days on the market, it gets socially stigmatised and a often a lesser price because people begin to wonder what is wrong with it. This is a proven fact! Make your home show-ready on day 1 and take every offer seriously. Make sure your agent is a strong negotiator and able to protect your interests. If you are moving to another home, make sure your agent does not leave you homeless. There are a number of marketing tools to make your home attractive to out of state buyers like VR Tours and videos. Is your agent making sure you are going to get top dollar for your home? Live in downtown Boise including the area to the north into the Foothills and and to the east following Hill Rd. Enjoy all the amenities of Boise plus the great shops and restaurants scattered throughout. This area includes several condominiums and many historic homes. If you want to live off Warm Springs Rd and enjoy the direct Foothills access, as well as, the Boise River and some fun local shopping and eateries, check out NE Boise. This is an active community, as there is also golf and only minutes to downtown. Just a little ways from downtown is open spaces along Federal Way and Hwy 21 with great views and still a short commute to downtown. Highway 21 offers access to Lucky Peak and the mountains surrounding Idaho City. "The Bench" area is located south of downtown Boise running along the bench which an elevation about 70 ft above the valley floor. This area has had considerable growth though there are limited services and shopping in this part of town. While homes for sale are limited, living south of the freeway is becoming more popular. South of the Bench area is plenty of shopping from the stores between Franklin Rd and Fairview, including the Boise Townsquare Mall along Milwaukee. Homes located along State Street and Hwy 55 enjoy the Boise River and Foothills as nearby amenities. So if you enjoy the outdoors, this area offers a great lifestyle for you! Enjoy a leisurely drive along Hill Rd or get out of your car and take advantage of great hiking trails including Hyde Park. Following Chinden Blvd west between the Bench and Boise River is Garden City. Everyone will enjoy Whitewater Park and the Greenbelt. 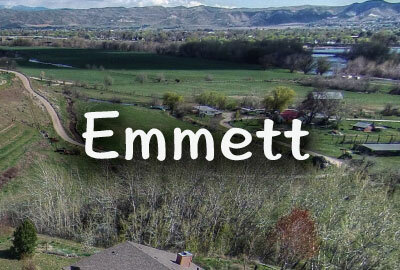 The average price of a home in Eagle is far above much of the area due to it's location and the caliber of homes and communities located here. Many communities have magnificent entrances with a water feature and many homes are on small lakes. Eagle also offers great restaurants and shopping. Move to the country! Enjoy a slower pace even and the peace and quiet of of a one stop-light town and only 12 minutes to big city shopping. Many prefer living south of the freeway as there is a not quite the congestion. Here you can also find more quiet as well. Meridian is one of the fastest growing cities surrounding Boise. It is centrally located to the entire Treasure Valley and offers great communities as well as shopping and restaurants. Kuna is widely known as the gateway to the Birds of Prey Sanctuary. This area is also close to Swan Falls and Snake River and while it is relatively close to Boise, it is much less expensive to live here . Enjoy open space and quiet, and only 12 minutes from the freeway. The area around the Idaho Center and Garrity Blvd has seen an major increase in homes and business. Centrally located to the valley and easy access to I84 makes this an easy choice for many. Nampa Idaho is a peaceful place with lots of open space including the popular Lake Lowell. Growth of this area has spurred many new stores and restaurants. Located south and west of Nampa is a diverse area around the shores of Lake Lowell. Rolling hills provide great vista views of the Boise Foothills and the Owyhee mountains. Middleton is a place where everyone knows their neighbors first name and the entire town comes to support the high school football team. This is a small, more agricultural based, town that is friendly and growing. Caldwell offers open space and more or a rural setting beyond downtown. Agriculture plays an important part of the economy and culture. Convenient location close to the interstate and shopping.